← Question of the Month: February 12, 2019. This is a submission to the March 2019 Carnival of Aces “Symbols of Identity“. If you follow my personal blog, you may be aware that I have taken up natural fabric dyeing as a hobby. In fact, the very day I first saw the theme for this months’ Carnival of Aces, I had by sheer coincidence dyed some fabric. Let’s start there. This is one of the linen fabric pieces I dyed on the day that I learned about this month’s Carnival of Aces theme. The dye I had used was tara powder. I tried using it on some cotton, and I discovered that tara by itself does not have much effect on the color of cotton. The cotton came out with the same shade of off-white as it had before. Maybe if the cotton had been bright white to begin with the tara powder would have dyed it off-white. (Notice that, even though it was not my intended result, white is one of the colors on the ace flag). This may have been an example of tara powder being a ‘clear’ tannin dye – i.e. it’s what’s recommended when you want to use a tannin mordant with a minimal change in color. Some of you right now might be wondering what the heck ‘tannin mordant’ means. I’ll explain ‘mordant’ first. ‘Mordant’ comes from the French word ‘mordre’ which means ‘to bite’. Mordants are chemicals which allows a dye to ‘bite’ a fabric i.e. it causes the dye to chemically bond with the fabric so it won’t wash out easily. Tannins are a type of chemical which can ‘bite’ fabric. There are many things which are high in tannins, such as tea, coffee, and red wine. If you’ve ever had difficulty washing out stains caused by those substances, it’s probably because the tannins had ‘bitten’ your fabric. If you want to change the color of fabric, you can intentionally take advantage of the ‘biting’ power of tannins. Another common mordant in dyeing is iron. You know what has high iron content? Blood. Now you know why blood stains can be so difficult to wash out. (Tip: iron requires heat to chemically bond to fabric, so if you want to wash out a blood stain, rusty-nail stain, or any other kind of iron stain, use cold water to weaken the ‘biting power’ of iron). So why did I bring up iron? You see, after I dyed the cottons with tara (which actually did not change their off-white color), I put a little iron sulfate into the dyebath. Then I put in some linen fabrics. Why did I add iron even though the tara dye comes with its own (tannin) mordant? First of all, iron is stronger than tannins. Second, iron is not just a mordant. Iron is also a color shifter. Different tannin dyes produce different colors, including red and yellow, but most tannin dyes produce some variation of brown. But when tannin dyes are mixed with iron, they tend to shift to grey and/or purple. And a really high concentration of tannins and iron can produce black. Now you see the connection to ace colors. I wanted the linen fabrics to be purple, not light brown (or white). That’s why I added iron sulfate to the dyebath. 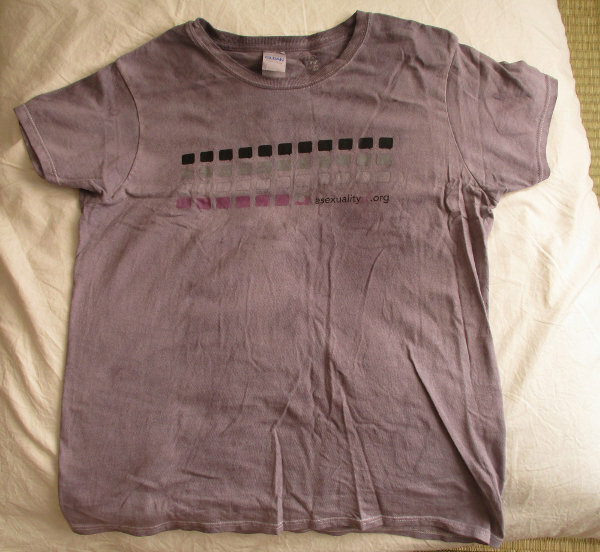 This is what the ace t-shirt looked like before I dyed it. This is what the ace t-shirt looks like after being dyed with tara powder + iron sulfate. And that fabric under the t-shirt is one of the cotton fabrics which I put in the pure tara powder dyebath (and it still looks the same as in this photo). So far, all of my experience with iron in dyeing have been in combination with tannin dyes. But that is not where the link between iron and ace colors ends. Before synthetic dyes entered widespread use, the most popular purple fabric dye in the world was logwood. It is still the most popular natural purple dye. 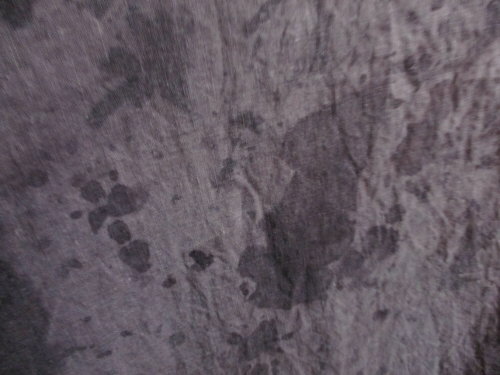 Unlike the tannin dyes, logwood dye cannot ‘bite’ fabric by itself, so it must be used in conjunction with a mordant, usually one of the alum mordants. If you can watch YouTube videos and see color, I suggest that you watch this video and pay particular attention to the last two cups in which logwood dye is mixed with alum and then with iron sulfate. If you cannot watch YouTube videos and/or you are colorblind, I’ll just tell you: logwood + alum = bright purple, and logwood + iron = black. Logwood isn’t just the most popular natural purple dye; when mixed with iron, it’s also one of the most popular natural grey and black dyes. Thus, various combinations of logwood, alum, and iron can yield purple, grey, black, and even white (since one can get white by using no dye at all). It is very helpful for using natural dyes in ace-related crafts. First of all, instead of needing to get a separate set of dye materials for purple and for grey/black, I can get it just by adjusting the ratios of one set of dye materials. Second of all, one of the lovely features of natural dyeing is that it is not consistent, and even if one follows the same recipe the results may not be quite the same. On top of that, I am an amateur with limited experience using natural dyes. 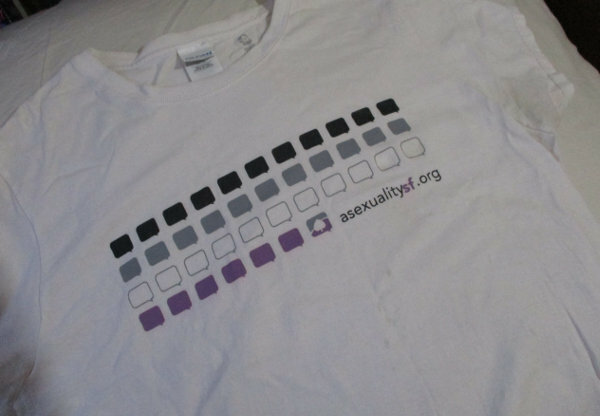 Thus, it is a relief to know that, if I’m using natural dyes for an asexuality-related project, if I try to get purple and end up with black, or if I try to get black and end up with grey, or if the dyes don’t leave any permanent color on the fabric and the fabric continues to be (off-)white (which is what happened at the beginning of this post), it’s okay because they are all ace colors. I also see a metaphorical meaning. Each color in the ace flag represents a specific category, but in real life these categories tend to bleed into each other (and bleeding, as we’ve already established, tends to involve fluids with a high iron content). Just as natural dyes tend to have variable results, there are many subtle variations in how people are ace. And you might think you will get one color and actually end up with a different color, just as some people think they are in one place under the ace spectrum, and then discover that they are somewhere else on the spectrum. This entry was posted in Articles and tagged ace colors, Carnival of Aces, crafts, dyeing, iron sulfate, logwood dye, tara powder. Bookmark the permalink. I’m glad you wrote this post, I may try this myself one day (though probably not any time soon). I tend to have lots of extra fabric lying around from old sewing projects, and have wanted to try dyeing some of it, but have never really gotten around to looking into it in detail. This gives me a pretty good place to start! And it’s really cool that all the ace colors can come from the same dye materials. I bet you could get a lot of neat patterns from dyeing different parts of the same fabric multiple times with different ratios of the dye materials. Oh yes, I plan to (some day) do that type of project. – Iron sulfate is dangerous because the body can absorb it very easily, which means that ingesting even a small quantity could cause iron poisoning (iron sulfate is used in some iron supplements, so a tiny, tiny quantity might be good for the body, but is it still important to be careful when handling iron sulfate). – iron can damage protein fibers (i.e. fibers which came from animals). Thus, iron should be used very, very carefully when dyeing protein fibers. Iron generally does not damage cellulose fibers (i.e. fibers from plants), which makes the process easier. – these dyes generally don’t work on synthetic fibers (in the photo of the t-shirt you can see that the tag, which is made of polyester, is still white). That said, I’m glad that you liked this post! Well, one advantage of natural dyes over synthetic dyes is that it is often easier to dispose of them in a responsible way. I haven’t fully researched disposing of logwood and alum, but I’m okay with dumping tara dye / iron sulfate in my backyard (in fact, I have used iron sulfate as a soil amendment – it’s good for plants that like acidic soil with high iron levels). Good to know! I’d have to check with my partner about the soil first, as she is a botanist/wildlife ecologist in training and tries to keep our yard as good as it can be for native species. Unfortunately I think most of our soil is not so good right now, because of an old well someone dug improperly—not deep enough I think, so it pulled up a bunch of salt and made the ground much less hospitable for most of the native plants here. But maybe even if the yard isn’t a good place to dispose of the dye, C might want to mix some of it in the soil for her indoor plants.